Fans will be treated to a block party as the New Orleans Pelicans take on the Indiana Pacers Saturday night on Bankers Life Fieldhouse. 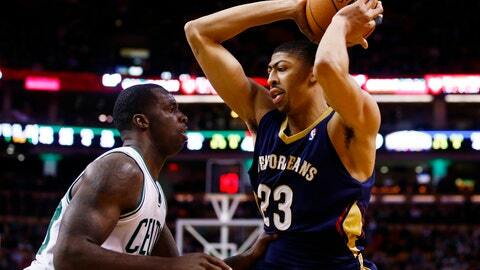 The Pelicans’ Anthony Davis and the Pacers’ Roy Hibbert have battled each other all season for the No. 1 spot in blocked shots. Davis comes into Saturday on top, ranking No. 1 in the league in blocked shots per game with 3.2. He also tops Hibbert in games with 4 or more blocked shots. Davis has notched 10 this season, Hibbert is just behind him with 8. "They’re dramatically different players," Pacers head coach Frank Vogel said pre-game. "Anthony Davis is like a pogo stick. He’s a high flyer who uses his athleticism to block shots. Roy uses his body position and angles. " At 28 years old, Hibbert is also older and larger than the Davis. Hibbert is 7’2" and 290 pounds. Davis is just 20-years old, 6’10" and 220 pounds. Pelicans head coach Monty Williams agrees with Vogel’s assessment of the differences in technique between these two players, but says he’ll take Davis’ athleticism any day. "I love it because he goes up in the air to get the shots," Williams said. "AD gets his hand on shots that no one else can. He doesn’t just get a hand on the ball in front of the basket. That keeps AD out of foul trouble." Vogel admits he’s asked Hibbert to back down some in the past month in order to keep him out of foul trouble. "If Roy’s numbers are down, it’s my fault. I’ve asked him to be more aware of keeping himself out of foul trouble. It leads to fewer blocked shots, but better team defense. We’re a different team when he’s in the game." Williams says he’s just hoping the officials are aware of Hibbert’s tendency to foul when going for the block.